← Where Do You Find Community? Photo credit: Holdgrafer Photography. Copyright 2012. All rights reserved. The past few weeks have been incredible–for many reasons. Reason #1: I’m pleased to report that my artist block is lifting…and I’ve got five projects in the works or on deck to show for it! One is a large format mirror with a shooting star motif, another is the start of a large format portrait of my first friend and cousin, Mirra, and her two friends from California. The third is a glass-on-glass piece based on an amazing photograph caught by a photographer (see #3) who is very near and dear to my heart. The fourth is an idea in progress based on a great sunset walk along the Stone Arch Bridge in Minneapolis and the resulting skyline view I took in… The fifth is a commissioned Minnesota Gophers Women’s Basketball themed gazing ball. Watch for more on all of these SOON! Reason #2: One of my pieces was selected for use in a logo design in Los Angeles, California! Check it out! How cool to be found on the Web by two women in LA (who I otherwise do not know) and receive such a cool compliment! Reason #3: Last in the list, but quite certainly not least…the Divine Ms. N! Gifted photographer, lover of music and basketball and wee lads & lasses, amazing auntie-sister-daughter-friend, undercover super hero, and all-around exceptional human being. This woman makes me laugh, inspires me and has reaffirmed my faith in the Universe. 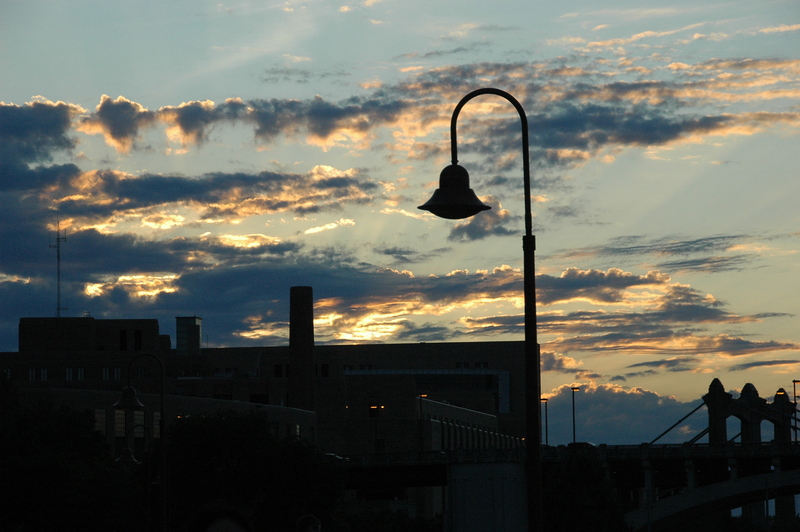 (The image above is hers and is my current favorite from our walk on the Stone Arch bridge last week.) Here’s to the start of an amazing love story…I thank the Universe every day for your presence in my life! This post serves as a reminder to you, fair reader, and to myself, that amazing things are out there for all of us–you must simply be open and willing to receive the good stuff! Wherever you are in your journey, I hope that you will open yourself up to all of the possibilities that the Universe holds for you. You won’t regret it! This entry was posted in Mosaic Musings and tagged inspiration, minneapolis, muse, photography, stone arch bridge, universe. Bookmark the permalink. So very happy for you! We still need to get together one of these days. Say do you still have my sea turtle? Thinking I still would like to buy him if you do. Talk soon. I don’t have that sea turtle anymore….but I would love to create one just for you! Let’s get together soon, yes? We could go out and pick your turtle base…I miss you, friend. Sending you a big hug! One just for me would be awesome. I miss you too! Getting together soon would be good, it sounds like you are a busy girl. Let’s chat soon. Returning the big hug!